Ants have been around for at least 140 million years, and they are believed to have evolved from wasp like creatures after blooming flowers appeared on Earth. There are 14,000 known ant species (1.4 percent of all known insect species) and an estimated ten thousand trillion individuals ants. Their total weight is about equal to all the people in the world and is ten times that of all other insects combined. The ant is a small sized invertebrate that is found all around the world, with the exception of the polar regions including the Arctic Circle and Antarctica. As with many other species of insect, there are numerous ant species inhabiting many different environments all around the world. Ants are found in many different sizes and vary in color depending on the species of ant. Some species of ant even have wings so are able to fly which only extends the range of their territory. In the more humid environment of the tropical jungles of the Southern Hemisphere, the ants are generally of the bigger species, often reaching more than a few centimeters long. Ants are extremely sociable insects and have a complex social structure where every ant individual has a purpose (effectively a job). Ants live in colonies and have a social structure from the worker ants that gather the materials and food, as well as nursing and caring for the ant larvae (the babies), to the queen ant that runs the nest and is the only female that reproduces in her colony. The queen ant often can live for over a year which is considerably longer than the lives of the worker ants which only really last for a couple of months. The queen ant produces between 800 and 1,500 eggs per day which are fertilized by the sperm of the male ants which is present in the nest. Remarkably, ant eggs that have not been fertilized will still hatch but produce sterile female ants that become worker ants as they cannot reproduce. Ants are omnivorous animals and therefore eat a mixture of both plant and animal matter. The diet of the ant primarily consists of leaves, fungi, honey, nectar, small insects and dead animals, although the exact diet of the ant depends on the species. Some ant species have a more herbivorous diet, where other species of ant mainly eat meat. Due to their abundance and small size, ants have numerous animals that prey on them from tiny insects to reptiles, mammals and fish, and even certain species of plant have also developed ways in which they can digest them. If we had the muscles in proportion to the ants we would be able to-carry a Mercedes over our heads! Go Ants! 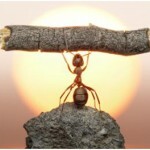 If any group of species were to be labeled as king of the jungle it would have to be ants. 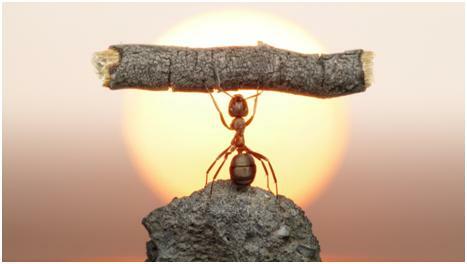 An ant is said to be able lift up to 50 times its own body weight, and be able to be pull more than 30 times its own body weight. This is the equivalent of an average human adult lifting a fully grown African elephant! Go ants! The problem starts when they want to take up residence in our homes and offices, and ants out in force during fall and winter. They can basically invade your home or office through any crack or hole. And rarely are there only a few. So if you see one, it might just be a lonely ant that has lost its way and made it into your home. But if ants are actively cruising your house in the fall and winter, or you see more than just a few, it’s more likely that its family members are somewhere close by in your home, too! I know you probably don’t want to hear this, but they probably have made a nest inside. This way to the food guys! Come and get it! Once inside your home, they are extremely difficult to get rid of. Generally they are seeking sweet or greasy food, or water. They love sugary foods like soft drinks and syrups. Once an ant finds a food source, it alerts the other ants to “come and get it.” Before you know it the trashcans, counter tops and cabinets are taken over by ants! But don’t worry; there are ways to combat these guys once they have invaded. Cleaning up messes can help reduce the problem. Keep counter tops clean of food and drink residue. Frequently wipe out cabinets to remove food debris. Thoroughly rinse out soft drink cans and bottles before throwing them in the trash and take the trash out often. Don’t leave unclean dishes in the sink or dishwasher. Keep sugary foods like cereal in sealed containers. Some household plants attract small insects, like aphids, that produce honey dew. Ants will feed on honey dew. Controlling the insects on plants or selecting plants that are not susceptible to them will help to deter ants. While all these methods can help reducing them temporarily, it won’t get rid of them all. So before you have an even bigger ant problem on your hands, the best thing you can do is contact a Minnesota Pest Exterminator who has experience with ant extermination. They can properly identify the ants in order to devise a treatment plan that will be most effective. Although they do charge for their services, ants are one pest for which professional treatment may be worth the extra expense.